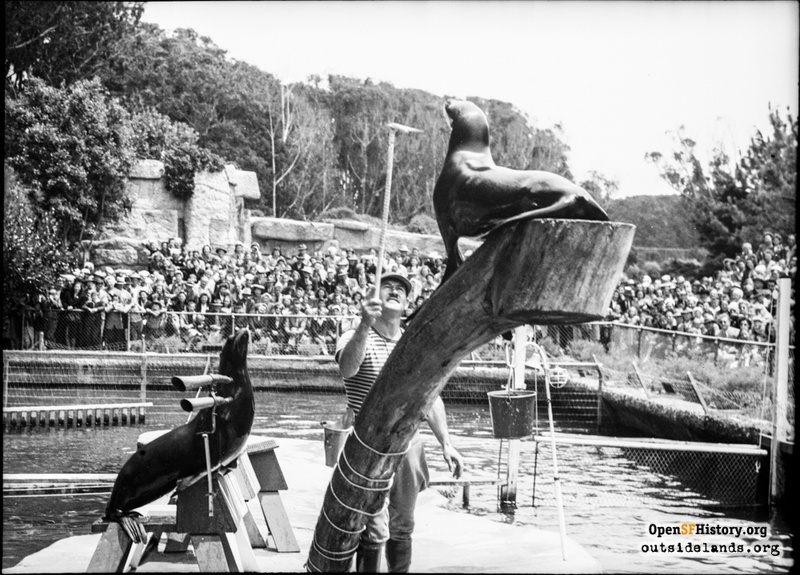 Frank Dunnigan remembers childhood rambles at the San Francisco Zoo. Ten years earlier, those of us who were growing up in the Sunset and Parkside Districts (yes, they really are two districts, but I'll bow to the argument that there is some overlap), would have embraced these S&G thoughts whole-heartedly. For most of us, birthdays fell during times of the year when it was cold, rainy, or foggy, so a lot of our celebrations were held in a downstairs "rumpus room" of one home or another on our block of 18th Avenue. Sequestered into a single large room, often with a linoleum floor, the chaos of a dozen or more young children, on a sugar high of cake, ice cream, and candy, could be somewhat contained and not overwhelm the lady of the house. But for those lucky few who had been born in September or October, birthdays usually meant a glorious Indian summer day spent with friends at the Fleishhacker Zoo. 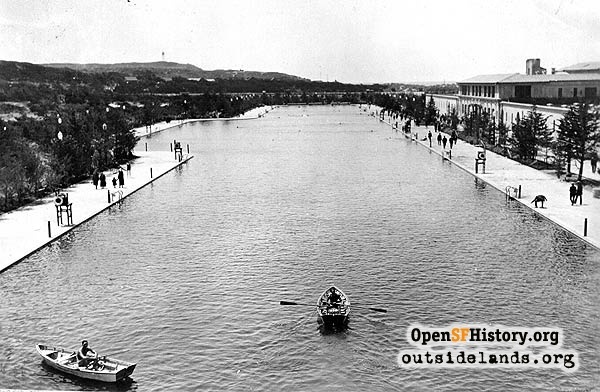 We all knew the story of brothers Herbert and Mortimer Fleishhacker and how their personal generosity had built the Zoo and the adjacent Fleishhacker Pool (so big that it was patrolled by lifeguards in rowboats) out there at the end of Sloat Boulevard near Ocean Beach back in 1929. In retrospect, I have to think that it was a highly positive thing for kids to learn, at a very early age, that personal philanthropy can benefit an entire community. Sadly, we don't see as much of that today, but that's another story. The mere act of getting to the Zoo, early in the day, was a big part of the adventure. Not all of the Moms drove back then, so the younger children, mostly pre-schoolers, generally got to ride, six or eight of them squished into one car—no car seats, no seat belts, no crash helmets, no permission slips, and nothing bad every happened! Meanwhile the rest of us walked downhill on 19th Avenue with another group of Moms, to get onto the #18 bus on Sloat Boulevard. 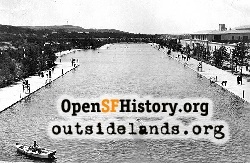 For the return trip home, the Moms rightly figured that it was better to get on the L-Taraval streetcar right there at the Zoo, and come home via Taraval, then walk DOWNHILL the two blocks to 18th & Vicente, rather than uphill from Sloat. Awaits you at the zoo. 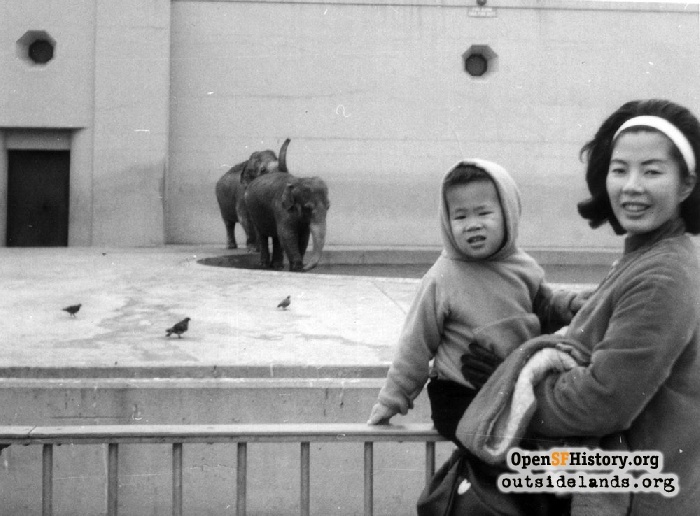 Even though the whole concept of zoos is no longer universally correct in some circles, all of us were absolutely thrilled to be there. Once we arrived, we walked down the wide asphalt path between the towering stone pillars, and there was always a heated discussion about where to go first—the Lion House usually won out, and if we were lucky, it was feeding time. Few things can hold a bunch of kids spellbound in quite the same way as hungry lions lunging for a dozen or so raw pot roasts tossed into the air by one of the uniformed handlers. 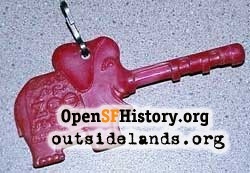 The recorded boxes, or storybooks, had just been installed at each exhibit, and they were controlled by a plastic key called a "Trun-key", with the body of a blue baby elephant that had a long trunk that would extend into a keyhole of the storybook and activate the recording mechanism. Using the "Trun-key" that was owned by one family (and ceremoniously passed around the neighborhood to anyone who was headed to the Zoo) was almost as much fun as watching the animals themselves. After the lions, we had to see the giraffes, which I still consider to be one of nature's most beautiful animals. The elephants squirting themselves with water, and the hippos and rhinos cavorting in their concrete pools and the bears in their grotto were also wonderful scenes to us, even though it must have been confining for each of them. The monkey house odor usually put off a few of the girls, and they all engaged in collective shrieking whenever a monkey would spit into the crowd. This usually got some of the boys into the mood for teasing some of the more squeamish girls, and the Moms would hastily huddle and decide that it was about time for lunch at the outdoor wooden picnic tables. Hot dogs eaten al fresco, along with popcorn and Cokes, never tasted better than they did in those days. Of course, the Coca-Cola then came in eight-ounce glass bottles and it was made with sugar rather than today's corn syrup. The hot dogs contained who-knows-what mystery meat parts, and the popcorn had probably been sitting around since the Zoo first opened, laced with more salt and preservatives than anyone would care to know. Still, life was about as good as it was going to get for a bunch of us who were seven, eight, or nine at the time—hanging out in the sun, having lunch with our friends, and surrounded by the whirl of activities at the Zoo. And for the host, 50 cents per child covered the entire cost of that lunch. This was the time that presents—most of which had come from Toy Village on West Portal, and which were wrapped for free in their easily identifiable patterned gift paper featuring a medley of tiny toys in bright red, yellow, and blue colors on a white background—could be opened. The lucky Mom who drove with all the pre-schoolers in her car always had custody of the birthday cake (either home-made or else purchased from Baronial Bakery on Taraval), plus the shopping bag of gifts that had been collected from the guests before setting out and the inevitable party favors provided by the host Mom—usually small paper sacks filled with a plastic whistle, a colored pencil, a small rubber ball, a balloon, a piece of bubble gum, and a handful of penny candies. The cost of the gift was usually $1 or less, and the favors cost just a dime or so per bag. After lunch, we would be off to the adjacent Children's Zoo and Storybook Village, which was entered through a miniature doorway in a castle. Riding on the carousel—the boys always liked the horses best, while some girls and most Grandmas favored the sleigh-type bench seats that did not rock or move at all. The music and lights were pounding into our heads, the adventures of the day went on, and no one had any concerns about time as we ran around, amid the sights and smells that only a zoo located near the ocean can contain. By mid-afternoon, the Moms decided that it was time for a rest and a snack—ice cream in a cardboard cup with a small wooden spoon or else those sticky pink blocks of popcorn, wrapped in cellophane, were the usual 10-cent treats—hey, no one ever said that a trip to the Zoo was a voyage of healthy eating! Those pink popcorn bars were ideal for sharing with the local seagulls, until someone in the group, usually one of the most fastidious girls, was rewarded with a large ker-plop from a hovering bird. Eventually, the fog would start creeping in, and that was the signal that the day was coming to a close. All of us were then herded on to the streetcar for the ride home. Trades were made from the treat bags, the birthday kid's gifts were examined, as the Moms nodded knowingly to each other that everyone was going to be in bed very early tonight. 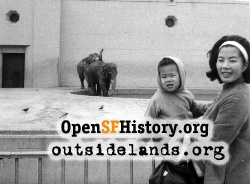 The Zoo was something else, thoughtfully donated to the people of San Francisco some 80 years ago by those benevolent Fleishhacker Brothers. They were so attuned to the needs of the public that they even included a cool, cavernous "Mother's House"—a place to rest for Moms and their little ones, and dedicated to their beloved mother, Delia. 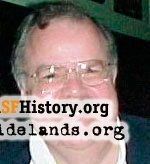 Face it, San Francisco in those days was populated by a group of extraordinarily generous people who did an immense amount of good for the public with their own personal funds—think Sigmund Stern Grove, the Steinhart Aquarium, the deYoung Museum, or Mrs. Spreckels' beloved Palace of the Legion of Honor. We'll never see the likes of those wonderful folks again. Must register 2-3 weeks in advance. Admittance without reservation is not guaranteed. Groups must be 15 or more. Less than the required amount regular rates will be charged. 1:5 ratio chaperones. Payment must be made on the day of the visit by cash, check, credit card & purchase order. No prepayment is accepted. Given that the Mom hosting the party back in the late 1950s was likely armed with no more than a single $20 bill to satisfy the needs of a dozen or more kids, plus a few fellow adults, it's easy to see why something as wholesome and innocent as a trip to the Zoo has fallen off the radar as a kid's birthday destination today. Ask about adding fun bucket-head "Animeal" Zoovenir animal heads to your birthday party! Even as late as 25 years ago, I was able to take my three godchildren for an impromptu afternoon at the Zoo and not break the bank. A single fresh 20-dollar bill, dispensed from the then brand-new, state-of-the-art ATM at Bank of America at 20th & Taraval, was enough to sustain the whole group of us for an entire day-long visit, including eats and admission. It was on a Sunday morning recently, that I had brunch with my oldest godson and his wife, now both 31 years old, at a sidewalk café near their home in Washington, DC. In addition to exchanging family news, Brian clearly remembered our Zoo adventures from his childhood in the early 1980s, and the three of us talked of our own recent visits to the various memorials and museums in our nation's capital—virtually all of which remain FREE. It is a saving grace that keeps our nation's capital a vibrant and exciting place—the public subsidizes itself by supporting a wide variety of interesting, educational, and rewarding entertainment venues with our tax dollars. There is some argument about whether or not the old days were truly better, but somewhere, beyond that shimmering blue Pacific Ocean horizon, beyond the paved-over big Fleishhacker Pool so filled with memories, a group of now-departed Moms, along with Herbert & Mortimer, and their beloved Delia, are commiserating over the sad state of affairs in their dear city, in which $500 birthday parties are the advertised norm for children. Collectively, they and we now know for certain that the sun has set once and for all on the golden days for children growing up in the Outside Lands. Page launched 1 July 2009.